Treat family, friends or colleagues to a show-stopping celebration in France. 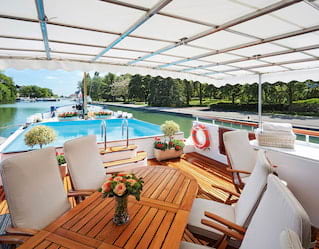 Onboard our luxury European river cruises, sumptuous dining is set to be a highlight. 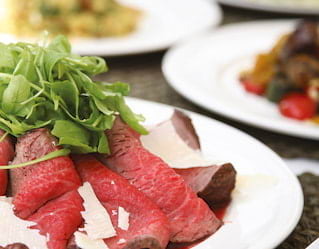 Guests can tailor menus to their tastes, or even hone their culinary skills with a cooking class. Exploring off board? Have us arrange a picnic in a sun-soaked vineyard or the grounds of grand château. Get in touch with our team to plan the journey of a lifetime, chartering one or more of our barges on a custom-made itinerary. From golf to antiques, we can tailor the destinations to create a dream trip that appeals to your whole party. Let us arrange exciting excursions and create bespoke menus brimming with artisanal treats. Our trademark warm-hearted service provides the perfect personal touch to your river adventure. Embark on the adventure of a lifetime with a private charter cruise and bring your family and friends along for the ride. Travelling with a large group? Charter two or three vessels together. With added space and shared facilities, it offers exceptional flexibility. Belmond Fleur de Lys and Amaryllis can travel together to accommodate up to 14 guests. Or book Belmond Fleur de Lys, Amaryllis and Hirondelle and invite up to 22 people. Dine with the winemakers themselves to uncover the secrets of your favourite varieties. Our Semaine des Grands Crus tour will delight wine lovers. It includes extensive tastings of Burgundy’s best wines, special classes and tours of world famous cellars. Join us on board and cook up a storm. At cosy classes in our barge kitchens or scenic stops en-route, your chef will uncover the secrets of classic dishes and local specialities. For wine connoisseurs, our Semaine des Grands Crus tour will be irresistible. Sample 33 of Burgundy’s top vintages over six nights. Wine classes, tours of famous cellars and special dinners with our resident experts and the winemakers themselves are an added treat. Get in touch, and we’ll help make your dream journey a reality.